It’s been a long time since our last Ask Me feature. But with the holidays just around the corner, this question seemed especially timely. I’m thinking about buying a new sewing machine, do you have any advice to share? Yes! I have one big piece of advice and then a bunch of smaller bits to add to it. The big piece of advice is to not go to your local big-box discount store and buy whatever machine (usually Singer or Brother) they have on the shelves. Those machines are not a good deal, and you will be much better off going to a specialty shop that sells sewing machines. The people at your local shop will really know machines and will be able to help you find the best machine for your needs. They can also service the machine if and when it needs servicing. And you don’t necessarily need to spend a lot more than you would have on that discounted machine at the Target/Costco/Walmart/etc., but you’ll get a much better machine for the money you spend. Before you go to look at machines, take a few minutes to write down the types of things you think you’ll be sewing. Are you planning to make quilts? Kids’ clothes? Will you be sewing for yourself? Are you interested in making handbags or curtains or slipcovers for your sofa? What sorts of fabrics do you plan to sew? Cotton, silk, leather, denim? All of the above? The more information you can give the salesperson at the shop, the better they’ll be able to guide you to a machine that will suit your needs. Different machines have different features, and the more expensive the machine, the more features it will include. Some machines are specially designed for quilters and have a larger space between the needle and the machine so you’ll have room to fit a quilt. Other machines have lots of fancy stitches and even computerized embroidery features, if you think you’ll be doing a lot of embroidery. Some machines are especially durable and can handle heavy fabrics. And other machines are designed to be light and portable. While you don’t need to spend a lot of money to get a good machine, the larger your budget the more bells and whistles you’ll get. I do love the automatic thread cutter and the fancy automatic buttonhole feature on my high-end Janome, but I’ve sewn all sorts of things (silk, wool coats, etc.) on my little portable Janome Jem, too. I could probably get by with just the Jem, but the fancy machine offers lots of little features that make my life easier. And it keeps up with me and my needs really well. The Jem doesn’t have a lot of the settings I prefer, so it’s not as convenient as my fancier machine. It’s always a good idea to go shopping with a budget in mind. While you’re considering your budget, think about how flexible it is, too. If you see a machine with a feature you think would be really useful, are you willing to spend a little more for it? When you’re buying a sewing machine, I think it’s important to think down the road a bit. You’re investing in a machine you will probably keep and use for a very long time. So if you’re able to spend a little more for something that will keep up with your developing skill level it will save you money down the road. While you’re shopping, look at a variety of machines with different features and try out a few before you decide. Try threading the machine and sewing a few seams to see how it feels. Bring along scraps of different fabrics you like to sew in order to see how the machine responds to those fabrics. Try a buttonhole. Finish a seam allowance. Take your time to try it out! Different sewing machines offer a mind-boggling array of options. Don’t be distracted by the features you don’t need, and instead concentrate on the features that will be important to you. Here are a few of the features I look for in a good apparel sewing machine. These are my personal preferences. Your list may be different than mine. Great buttonholes. Especially buttonholes that can be programmed so they’re consistently the same throughout a garment. Mock serger stitch. Most new machines include this stitch, which is so convenient, especially if you want to finish the seam allowances of a garment. I like that the thread color can be a perfect match! When you’re using a serger you need to buy three for four spools of thread, which can be costly (and annoying to re-thread). Sometimes the mock serger stitch is just more convenient. And if you don’t have a serger, the mock serger stitch is a lifesaver for finishing seams. A good stretch stitch for sewing knits. The mock serger stitch can work really well for knits, but I also like something that resembles a straight stitch for topstitching with a little give. The ability to change the stitch length and the width of the zigzag stitch. This is really valuable so you can adjust the machine to any fabric you’re sewing and any needs your project has. My Jem doesn’t have this feature, and I often wish it did. Ability to change the speed of a machine. I don’t use this feature much (I keep it on the fastest setting and often that’s not fast enough! ), but I do appreciate being able to slow down the machine when I’m teaching kids to sew. Runaway sewing machines can be very stressful when you’re seven. Needle down feature. So convenient when you’re doing tricky sewing and need to lift the presser foot often. Walking foot. If your machine doesn’t come with one, buy it when you buy the machine. You’ll use this many, many times. My much-beloved automatic thread cutter. Hardly a necessity, but oh so convenient. I hope that helps, especially if there’s a new sewing machine on your Christmas list. Feel free to add your own suggestions in the comments, too. There have been several discussions about sewing machines in the forums, if you want to read more. My sewing machine repair shop is also a licensed dealer of high end machines. They always have a nice selection of used machines they’ve taken on trade that they guarantee. They’re very knowledgeable and helpful about not only the machines they sell new but also about a the various brands they sell used. I strongly agree about buying from a dealer who is near you. So important to learn that you haven’t threaded the bobbin correctly and that there is actually nothing wrong with your machine. : ) And when something does go wrong, you can get it fixed. You won’t get that at a box store. I so agree with your point on the buttonholes, if you are sewing garments. I recently bought a new machine (by necessity) and that was one of the first things I looked at! And, yes I am old, but this machine cost more than my first car and is worth every penny! When I got my machine 35 years ago (a Viking), the dealer included instructional lessons. I had an hour lesson to introduce me to the machine. A month later, after using the machine, I went back for another hour or so to answer any questions I had. You cannot get that from a big box store. Unfortunately, that dealer is now gone. The machine is going strong. It is one of the best birthday gifts I ever received. The single most important factor in buying a sewing machine is accessing servicing. I have lived for more than 30 years in a city where having my sewing machines serviced is very difficult. At one time there was one electrician who had an interest and a talent for sewing machines, He was excellent. But later I had to rely on an aircraft engineer to repair my Elna and she was dreadful. The agency where I bought my Bernina closed when the owner decided to work in a mine. There is a shop where Janome machines are sold and serviced. But no other brands. It is not practical to send a sewing machine to another city. Have you seen how freight companies treat parcels? Lots of help is available through the internet, but not servicing and repairs. I have an old “New Home” machine that I bought used when my Singer Deluxe bit the dust. The New Home is solid metal (no plastic) and very heavy. It is a true work horse. I want to purchase a new machine with bells & whistles. However, the one thing I love about my old New Home is the needle plate & bobbin are located in the FRONT of the arm. When sewing cuffs etc., the back slides out to open up the arm. I have fallen in love with having the needle pate in the front. I’ve not been able to find a machine with the needle plate in the front – they are all in the back. Even Janome (formerly New Home) are in the back. I bought a Singer that was rated #1 and had great reviews. I hated it. I only kept it couple of weeks and sold it to a co-worker. The needle plate was just too far in the back and the machine light was way, way too dim – totally not functional. The machine light on my New Home is so bright, I could sew without any other light on if wanted to. Any machine suggestions? Thanks! Ladies, thank you for all your comments and thank you Leisl for this post. As an old-timer beginner there is no better source of info than those who know their stuff. I am now a little bit better equipped to make a purchase. I am so excited!! Thanks all. 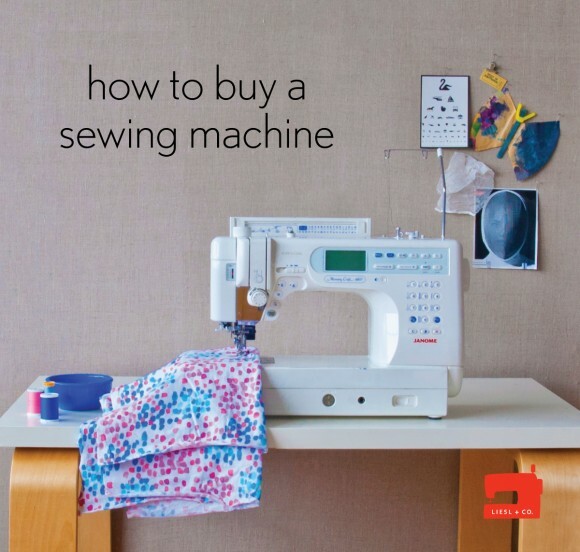 Thank you for all the information provided.It’s really helpful while purchasing a new sewing machine! I purchased a White (Singer) 1466 model sewing machine from Goodwill for around 40 dollars. It is made of steel and built into a table, allowing the machine to fold down out of sight. Although portability is not one of it’s strong suits, I think it is going to last me a while. It does absolutely everything I need it to (including zig-zag) and it is very good quality. I can’t remember what years this model was manufactured, but I think it was early 70’s. Definitely a good buy! Thanks, Liesl! I enjoy your tutorials as well as appreciate everyone’ comments. Can anyone recommend a vendor in NYC including Long Island? My first instinct was to purchase a sewing machine from Walmart or amazon. I’m an older beginner…I’ve watched my grandma sew and I know how to thread a bobbin but that’s all. What about JoAnn’s?